D a n c e s W i t h W o o l: Yarn! I could not love it more. Yarn! I could not love it more. I think I am done with the Alpaca bin for now and the main reason is that it is almost empty! I learned a lot from the experience. First, the fiber and yarn made from it, is pure delight. I love the softness and the halo and the drape too. 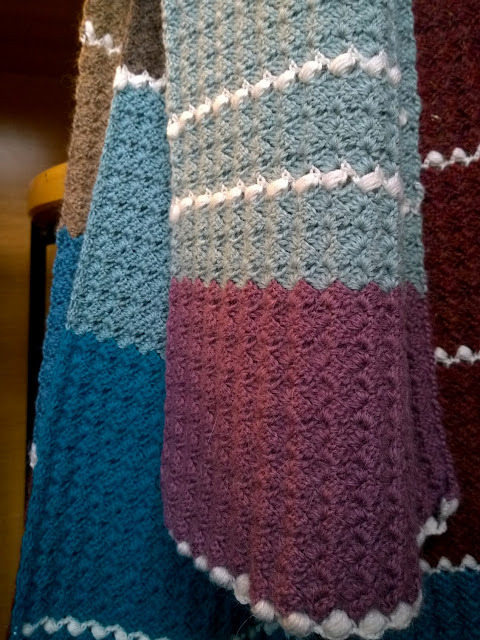 Lovely stuff for shawls and scarfs; to have a blanket made from alpaca yarn, would be pure bliss; where ever you need some extra shine, halo and drape, alpaca could be your fiber to do the thing. 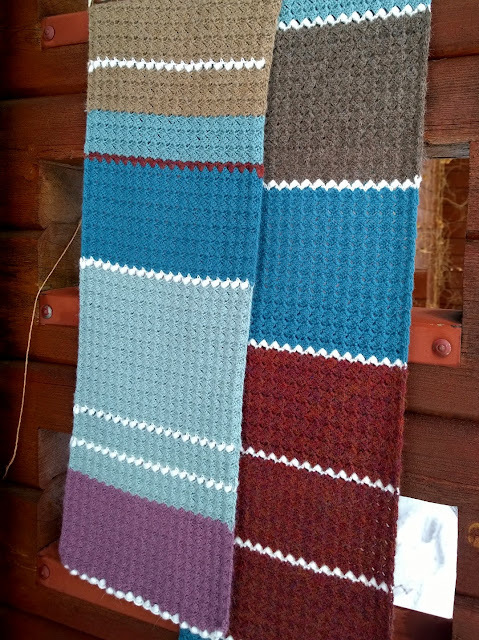 I had some alpaca combined with silk and merino wool in the bin too and I crocheted it into this scarf with the rest of the different alpaca brands, and I must admit that I did not enjoy that as much as I enjoyed the pure alpaca. I am not sure if it was mainly because of the brand of the yarn or if the silk/merino content just made the yarn more dull and stiff. While pure alpaca glided through my fingers with very little effort, once I came across the silk/merino blend, the whole process was more of a work and the outcome was not as lovely even though the color was just perfect. The feeling might have been totally different with other tools… I think I would have loved to knit with the blend. The other scarf came out even longer than the first one. When I made the first one, I picked out all the treasures and ploughed through them thinking that most of the Alpaca stash would be finished when I put the last stitch in, but so wrong… I had so much left. Isn’t it funny that whenever I look at my yarn boxes and sort out the yarns and think of what I could make of them, I always think that there is too little for this or that and I close the box and search for something else. Now that I tackled one of the boxes that I have been looking at for ages thinking that there are only odds and ends, I end up having a lot. I had so much there that I could have knitted a sweater or a cardigan or two of them or could have done a small blanket out of them. Couldn’t believe how much was there in the end. This gives me a whole new perspective to my yarn collection. 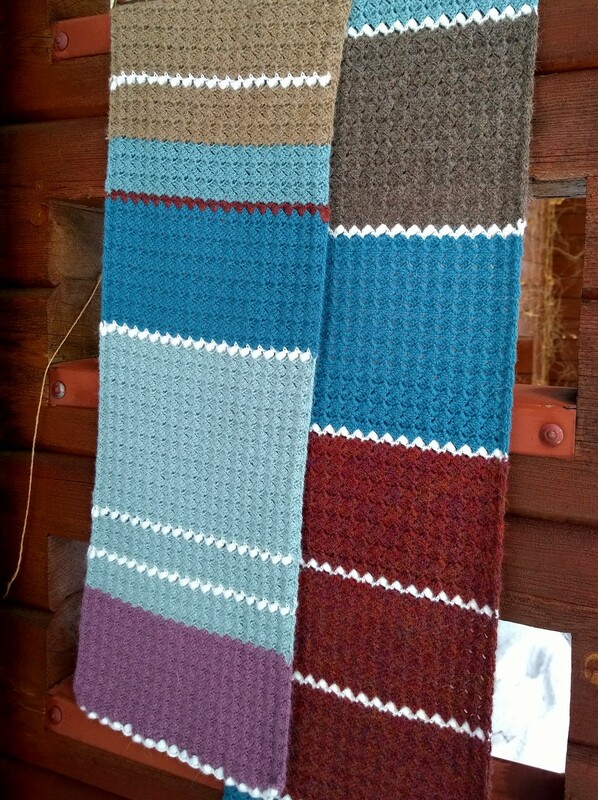 This last scarf has lots of different qualities or brands in it and they all came together beautifully. Again, I was cautious and thought that I would keep this scarf to myself since it was going to look odd but while looking at it now, there is nothing wrong with it. All these different yarns play together nicely. Again, lesson learned. Trust your stash, if you don’t seem to have enough in one brand, there is most likely something that you can add and it will work out in the end. If you are going to take this route, you need to be willing to rip if something does not feel right. But ripping is not that bad, it takes just a few minutes and once it is done and gone, one forgets it quickly. The pain is just a fleeting memory and the project is going to be so much better afterwards. I’m not sure if I can find anything else to say about the scarf. It is long, the color combination is the best I could do with the odd balls. There are parts that I love and parts that I don’t but they just make the lovely parts pop out better. 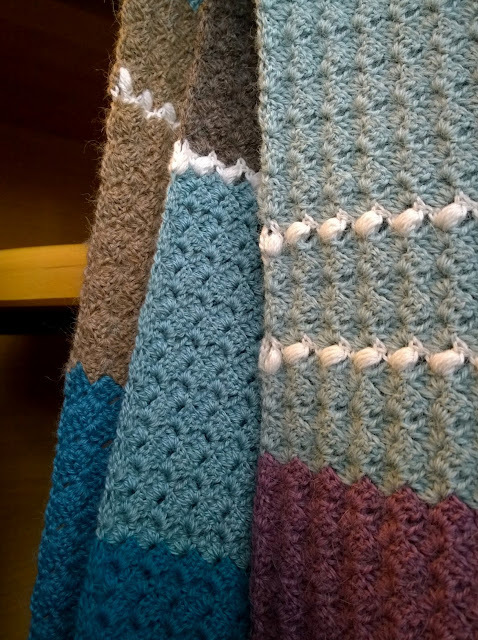 Making a long scarf is a very good exercise in getting your stitches even and keeping the gauge same during the whole project. Some unevenness will block out but otherwise you need to be quite consistent with the gauge for the scarf to come out with even sides. I had totally forgot that. The gauge truly matters when you are making a scarf, it should stay the same. This is the whole pile of knitted/crocheted things out of that box of Alpacas. I have still few balls left, of which two are in a bad shape after Mr. Cat got hold of them. I have put a small note inside to remind me of making pompoms out of them. The rest I am most likely going to use for trying out new stitch patterns or as accent yarns. I used about 1100 grams of the thinner ones and about 200 grams of the thicker, which in meters and yards would read approximately 3740m/4155y and 440m/488y. These are just about figures as I did not recognize all the skeins and so had to estimate the yardage on them. But that is a very good number of the amount used this year so far in my quest of “knit/crochet from the stash in 2017”. In addition, there are the little kitties and their numbers are not so far in the tally. Once I make the next one, I will weigh the skeleton and add that number to the count. I now have a clean plate. I am free to pick up something new. I have an idea but I better not talk about it here just yet, I want to have this freedom of thought for a bit. Although I did make a little swatch of this lovely shawl Getting Ziggy by Sandra Paul of the Cherry Heart blog and podcast. It is crocheted and the construction is clever, I would have never known how to make this pattern laid out this way and I really needed to sample this to get it right but the instructions are very clear and it was easy to crochet in the end. Now I will need to find a perfect yarn to match for the pattern from the stash. I don’t seem to be able to knit myself neck pieces at present. It feels like they take such a long time to knit and are fairly quick to crochet and it feels like I am learning so much from every piece I make. It is the challenge that keeps me inspired. I swatched the same pattern with Rowan Kid Silk Haze too but with this skill level, it was too much of a challenge and I think I might be happier with knitting this yarn than crocheting with it. Now I am off to dive into the stash and see if I can find something inspiring. PS. I have surprised myself... In the beginning of the new year, I thought that I had lost all my willingness to play with yarn and the inspiration was buried under the piles of snow. It is February 16th and I have gone through about 4000m/4444y of yarn this year so far, I could have never predicted this. I am keeping my fingers crossed and I'll be very quiet, because I would really like to have and to hold this love of this craft... so wonderful to be inspired again! Your work is absolutely beautiful, Lene! Thank you for sharing it with us! Everything is so beautiful Lene. So glad your inspiration has come back!! Thank you for showing us your beautiful work. When I first found your blog, I read with delight every single post back to the beginning. You are inspiring. I have wanted to let you know that recently the New Yorker had a cartoon of a cat trying on clothes, saying, "No one designs for the cat body." You have stepped up and met this challenge! Beautiful work with lovely textures and colorways! You should never apologize for stash, it helps us in so many ways. Love the new design, I am not a huge mohair fan so would find that difficult to pull out if I made a mistake, which I would it is inevitable. GOod for you with the yardage, I am falling far short of that this year. You are very wise to let your stash keep inspiring you! I sometimes get frustrated that I do not have the time to make all the projects I picture in my mind when I look at my stash, but it would be much better to enjoy each project as I work it!